Create a Beautiful Life: Bula Fiji!! It has now been eleven months since our family trip to Fiji and I have finally scrapped the first page for our album!!! Obviously these things can't be rushed...maybe I am still on Fiji time?? 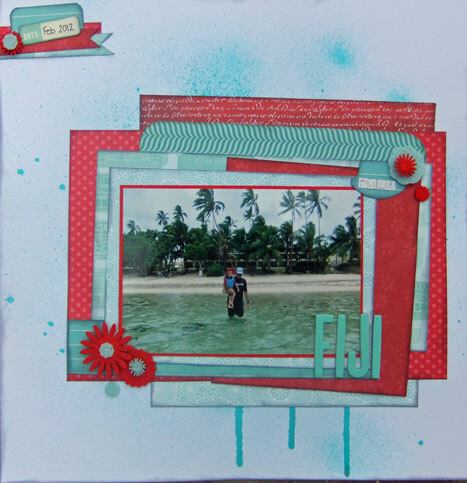 Anyways, I decided to have a go at the White with 1 challenge this month which was to create a layout using aqua and red (and white of course) and use a summer photo. I misted my background with Glimmermist in Turquoise and then raided the scrap box for papers in the colour range. 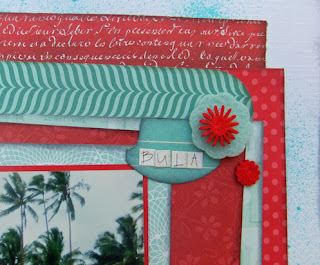 A bright happy page for the opening of the Fiji Album. I just hope it doesn't take another eleven months to finish it. love the mist and layering. thanks for your Lo for WW1 ! great job with the misting and this is one of my favorite color combos!